Sitting on the front porch with my niece Min one day, I just out of the blue said "Min, catch me a hummingbird hun".... so the crazy girl did! 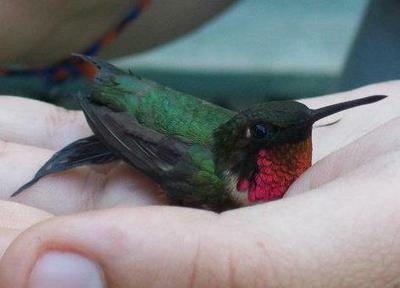 :) It was an absolute thrill to hold one and get a real close up view of this tiny little Ruby-throated hummer! We have about a 40 foot long fence covered with honeysuckle which attracts hummers all summer. Often, in the fall, we find their tiny nests embedded in those vines. My grandson came into the house one day with a tiny hummer in his hand, which he released outdoors after the whole family had a close-up look! Are they ever just black and white?